Help us to feed the horses this Winter: our Christmas 2017 Campaign Appeal has now been launched on JustGiving. Winter is a challenging time for all the horses at Brewham Lodge Stables, and a challenge for our dedicated staff to ensure they have all the right food they need. Which is why the theme for our Christmas Campaign this year has been: Please help us to feed these deserving horses this Winter - CLICK HERE FOR THE JUSTGIVING CAMPAIGN. Already with the darker evenings you can hear them whinnying for their supper! New on JustGiving this year is the option to link a personal fundraising page directly to this campaign, so please consider setting up your own Christmas challenge or event and involve your friends and family in fundraising. This is a really efficient way to help the charity, as JustGiving collects all the Gift Aid due from the tax man and passes it on promptly with no further hassle on our part. Meanwhile, on the Christmas theme, we still have a few of our super Christmas Cards available - CLICK HERE FOR DETAILS, so do not delay, order yours from Ping now, by calling on 07712 346604 or 01935 850559. Put the date Sunday 25 February 2018 in your diaries: we shall be holding our next major fundraising at Fontwell Park on National Spirit Hurdle. Your Charity Raceday planning committee is very pleased to announce that once again we will be holding our next major fundraising event at Fontwell Park on Sunday 25 February 2018. 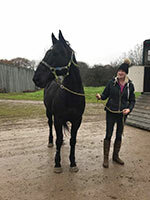 An example of the exciting charity auction items we have for you is a Gallops Visit for Two to the Inkberrow yard of our favourite up-and-coming young jumps trainers Tommy and Laura Gretton. Your visit to Middle Bouts Farm will include champagne breakfast in the farmhouse kitchen, a chance to meet the team and see all the horses. In the afternoon you will be taken racing, perhaps in the company of one of the experienced chasers with a Sanctuary link. On the left here is Edmund’s stalwart Jackthejourneyman. Whilst on the right is David and Barbara’s Little Jimmy, doing his impression of a Baudet du Poiton, though donkey over the fences he is not. The Trustees are delighted to announce that we have attracted additional volunteers to boost the leadership of the charity, impact on the delivery of our objectives and augment our horse welfare capability. Joining the Fontwell Park planning committee is Dave Olver supported by his wife Gerarda. 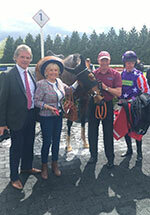 You can see them here in the winners’ enclosure in Kempton last year with American Gigolo and Jockey Noel Fehily. AG is now with Harry Fry in Dorset, not so far from Brewham Lodge Stables, so we hope to see them as regular visits, when they come to visit their horse. Also recruited to bring a further fresh perspective to the Fontwell Park planning committee is dressage competitor Aileen, whose professional consultancy background meant her offer, made on a recent visit to meet the horses and team at Brewham, to review our fundraising strategy was greeted with enthusiasm. Aileen is a natural shoe in for the post of part-time Chief Executive, which we have advertised on the Do-It for Horseracing website. Aileen’s commitment and enthusiasm is infectious: watch this space! In addition opportunities posted on Do-It for Horseracing have brought us Michelle, who is now part of Graham’s welfare support team as Area Field Officer Essex. 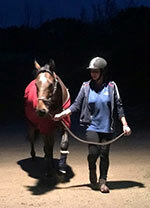 Michelle is a fully qualified and experienced equine nurse at the House & Jackson Equine and Small Animal Hospital in Blackmore and cares for ex-racehorses of her own. Michelle’s employers are fully supportive of her commitment to us as a volunteer: they see this as important for Michelle’s career development, good PR for the veterinary practice, and good for the welfare of the Sanctuary’s horses in their area – a win-win situation for everyone. 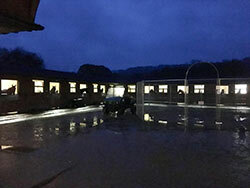 Graham and his team at Brewham Lodge have been fantastically busy finding new keepers and matching them to the horses ready to graduate from Brewham Lodge Stables, and welcoming new recruits for routine assessment and rehabilitation, as well as into the Peter O’Sullevan High Dependency Unit. Recent recruits include Dakota Rain better known as Trent. Graham reports: “A super looking 15-year old gelding by Indian Ridge. Having just arrived at the centre he is acting as though he has been here all of his life. A true gentleman in every respect I do believe that Trent will have a great future ahead of him, all we now need is to find that special person who will be lucky enough to take him in as part of their family.” Indian Ridge by the way is also the sire of High Dependency Unit mascot Wavertree Warrior, so Trent is really joining family now, with a new one to which to look forward! 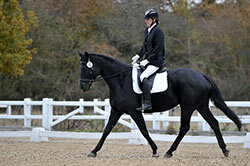 Meet Opus Too another new kid on the block: this is 6-year old bay gelding by Lawman out of Lake Coniston mare Jerez. Graham reports: “Arrived at dusk so lighting not to good I'm afraid but even in these shots you can see what a handsome chap he is. 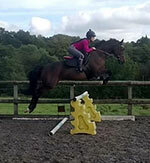 Just look at The Betchworth Kid, otherwise always known as BK, jumping for joy at his new home with Tracey. This super chap has so much talent and Tracey and her team are definitely the ones to bring the best out of him. Meanwhile pictured on the right, 15-year old Smart Mistress has been posing for some serious professional photography at her new home. Doesn’t she remind you of her sire: Silver Patriarch? 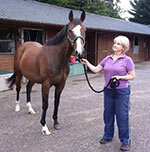 LOVE THOROUGHBRED HORSEPOWER AND WANT TO HELP THE RACEHORSE SANCTUARY THIS CHRISTMAS? 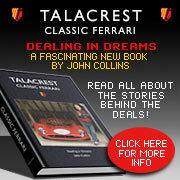 John Collins of Talacrest who has been a regular supporter of the Racehorse Sanctuary has just launched his book - Talacrest Classic Ferrari - Dealing in Dreams. This book tells the inside story about John Collins and Talacrest, from its beginning to present day and is also a wonderful catalogue of the world's most fabulous cars that Talacrest and John have been involved with. With approximately 350 pages, the book is prolifically illustrated with stunning archive pictures from Auto Italia and Marcel Massini amongst others and includes many important Ferrari road and racing cars. Many are accompanied with histories, track tests and how the deals were done. 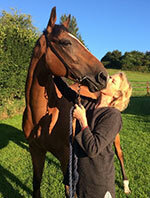 WHAT'S IN IT FOR THE RACEHORSE SANCTUARY YOU MAY ASK? Well quite simply - John has decided to split all the profits from the sale of the book between two charities - The Thames Valley Air Ambulance and of course - The Racehorse Sanctuary. Our Sandown Park Charity Raceday was a social and timely financial success. 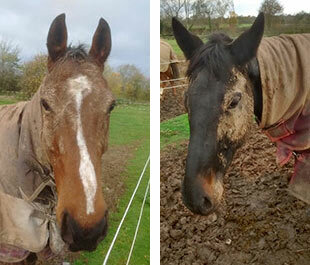 You helped us raise £35,000, which all goes to the care of the horses. A fantastic result from our Sandown Park Charity Raceday sponsored by SJP’s Max Patel, which cleared £35,000 in funds for The Racehorse Sanctuary. Thank you all so much for your help and support. It is difficult to know where to start with thanks: those of you who came on the day or all those who worked so hard behind the scenes to make the day so successful. You efforts are much appreciated: both our own staff and volunteers and the staff of the racecourse, coordinated by our primary contact Chad, who was doing this for the first time. The weather was good to us, the racing was exciting and a great time was had by all, exemplified by the lady who won the champagne prize for the Heads & Tails competition, and John Francome modelling the Ralph Lauren designer leather jacket - provided by John Collins of Talacrest and bid for by Kim Bailey in the auction so skilfully compered by Colin Brown. We must not forget Julia for her efforts beforehand and on the day. We are so sorry to lose you from the team Julia: we may struggle without you next year, but we hope you are back to good health and good luck in the future with your role with George Baker Racing.